The property may be in Missouri, but the clients wanted a 'mountain lake' to go along with their big, Rockies-style lodge. Kurt Kraisinger was happy to oblige -- both for the change of pace and for the scope and scale of what proved to be a vast, detailed and lengthy endeavor. Who says you have to live in the Rockies to get the perfect mountain home? 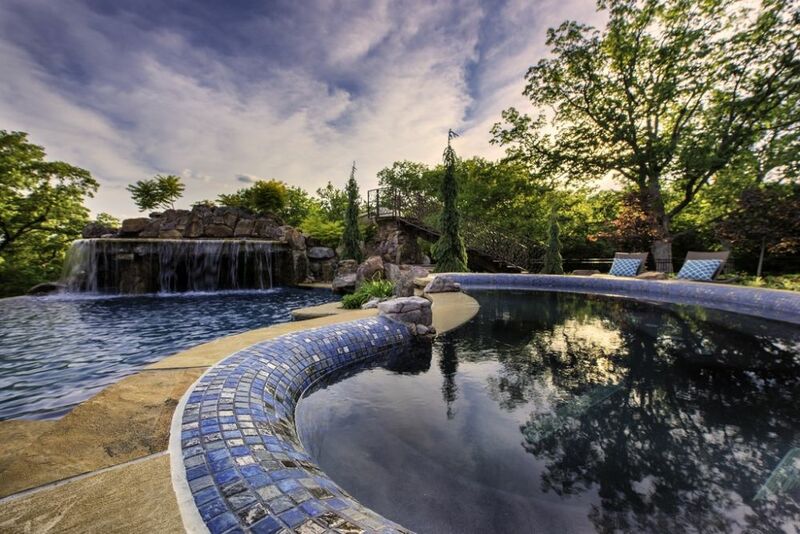 These clients are living that dream just outside Kansas City, Mo. Not long ago, they purchased land north of the Missouri River near Smithville, a rural outpost known for its rolling hills, plentiful trees and tobacco farms. It’s a place where relatively low-cost land is still available, and people have started buying acreage and building their ideal homes. If you do a bit of local exploring, you’ll find an eclectic mix of styles tucked away on these relatively large parcels. 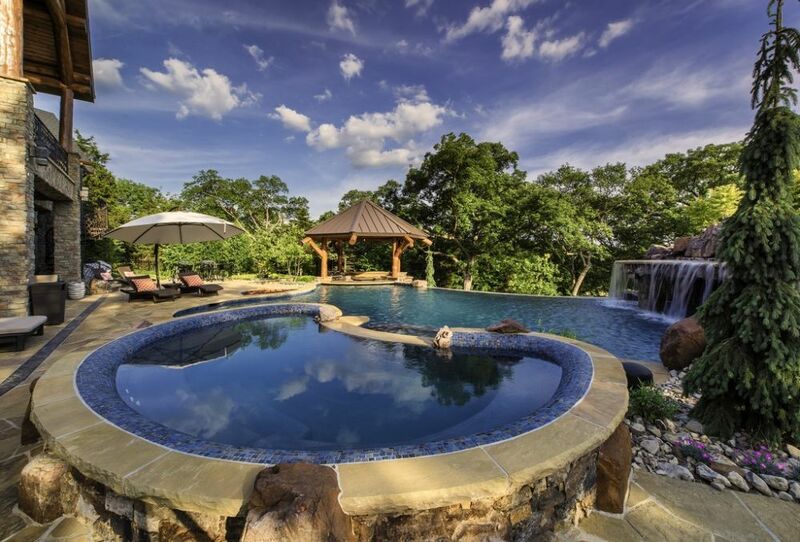 Many of the homes are large as well, but our client’s lodge-style home is among the biggest. He’s an entrepreneur who’s done well in a construction-related business, and he and his wife wanted the sense that a slice of Colorado had been transplanted to their property on the southern Plains. 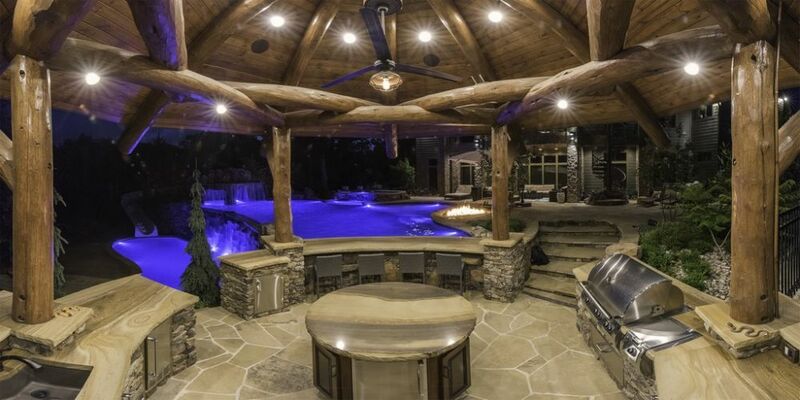 Our mission, which we gladly accepted because it was such a nice change of pace for us, was to harmonize our efforts with the home’s architecture and the surrounding space to create a mountain lake for the whole family (including three young girls) to enjoy for years to come. We at Lorax Design (Overland Park, Kans.) entered the picture when we were introduced to the homeowners by a contractor friend. 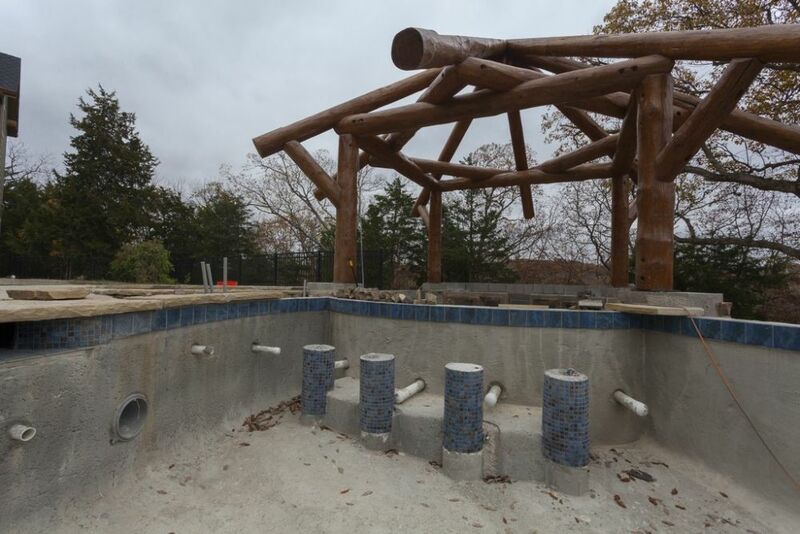 We ran through our usual introductory process, doing what we could to figure out exactly what they desired and learning that, among other things, they wanted an area for active pool play to go along with a grotto, a slide and a swim-up bar. We took those ideas out into the yard and began working through the possibilities. Immediately, we were confronted by the steep slope that defined the space – and just as quickly recognized that terracing the yard and operating on two levels separated by eight or ten feet would give us a way to hide the slide behind the grotto and have it dump riders on an “invisible” lower level. The cabaña is where we started the design, and its substructure is where we began construction by pouring its large drum and running dozens of pipes and conduits into the space (top left.) We then prepared the spa (middle left), the upper pool (middle right) and the lower pool (right) for successive shoots, following their completion (lower left and lower middle) by shooting the cabaña-related steps and landings (lower right). 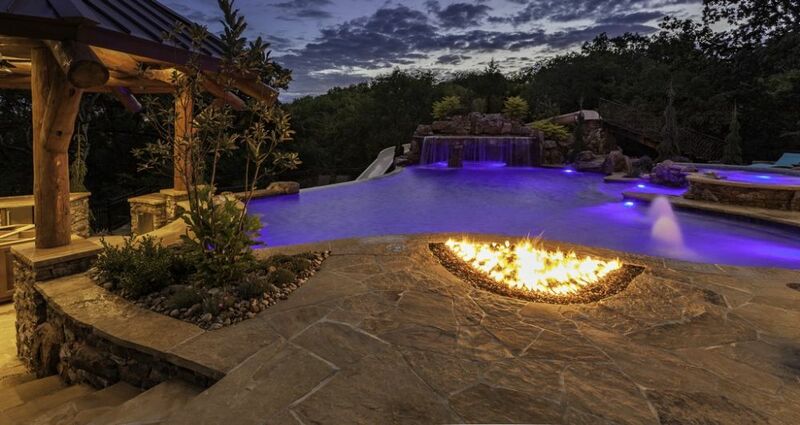 But the key to it all, as it turned out, was their request for a swim-up bar: To make it work, we decided to build a large, mountain-style, big-beamed cabaña on the steeper, left side of the space near a large, existing retaining wall. This would be an important two-level anchor for the project, with an outdoor kitchen and the swim-up bar on the top level and, down below, a hidden equipment room, a restroom and an adjacent outdoor shower. 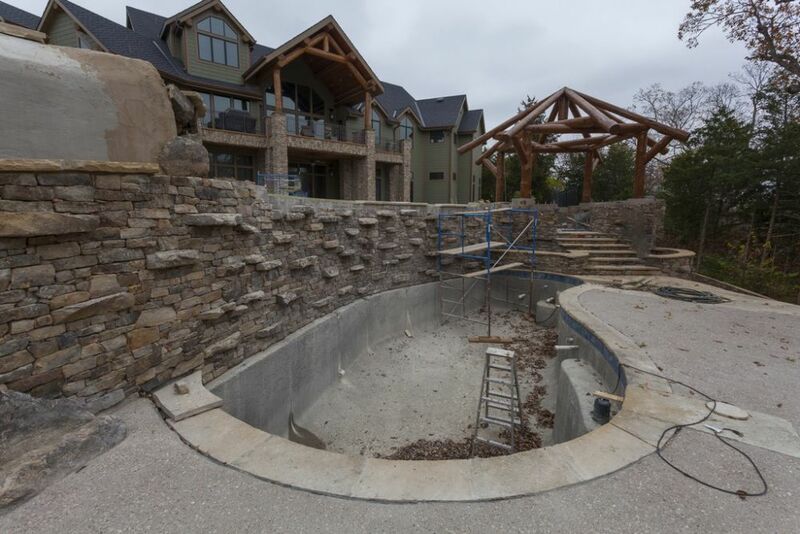 To balance this looming structure, we figured on placing a nearly-as-massive grotto/slide/rockwork structure on the opposite end of the pool. With the layout starting to coalesce, we headed to our offices back on the flatlands and started playing with the mountainous possibilities. What eventually emerged was pretty much as described roughly above, with the addition of a large, 12-person spa on the upper level and, directly below the spa’s dam wall, a shallow children’s play pool. Near the spa on the left is a large tanning shelf, also quite shallow, that offers easy access to the main pool, the swim-up bar and the cabaña. Finally, to access the slide wrapped around the grotto and its broad waterfall, we inserted a large, decorative bridge in place of the circular staircase the clients had suggested. The project took 16 long months, and we did what we could to keep working through cold and snow (left). Putting the cabaña’s floor in place was one key task (middle left and middle right), as was completing our last shoot to flesh out the grotto (right). The upper pool has a vanishing edge that flows into the lower pool down a decorative, stone-clad surface. The lower level is essentially invisible from the upper deck and from inside the home, offering an unexpected visual treat for those who get curious about where the slide leads and end up finding the eye-pleasing vanishing-edge wall looming over the space. The clients loved our presentation and, with few modifications, we finalized the design, prepared the construction documents and handed the project over to our Liquify Pools construction unit and an array of subcontractors and specialists we’ve worked with closely through the years. The relative ease with which the design came together stands in sharp contrast to the construction process, which took 16 long months from start to finish. With lots of clients, the length of this process might have become an issue. In this case, however, the homeowners were mindful of quality and, familiar with construction details, enjoyed watching the project unfold gradually while assuring themselves almost daily that everything was being done right. 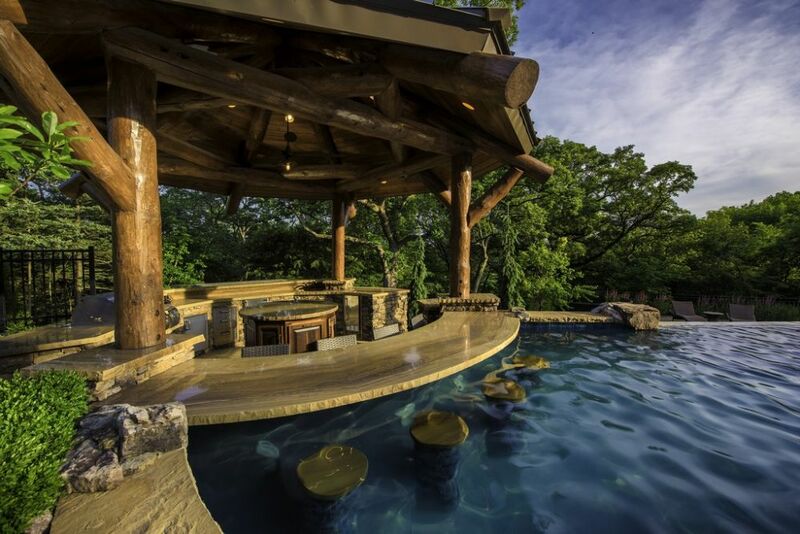 In all, construction included a big pour for the cabana substructure and five shoots, one each for the spa, upper pool, lower pool, stairways and grotto; these involved application of more than 200 cubic yards of concrete. There was also a tremendous volume of plumbing and conduit to accommodate: It was all headed for the lower-level equipment room, which meant burying everything at a very early stage and including a number of extra runs to accommodate any changes or unanticipated needs. While our focus was on containing the water and setting it in motion on all sorts of levels, there was plenty of work for the carpenters who built the cabaña’s roof and the stonemasons and assorted other craftspeople who installed the big decks (top left), lined the grotto (top middle left), completed the vanishing-edge wall (middle right), worked up to and into the equipment room and restroom under the cabaña (right), applied tile (bottom left) and in general brought organization to a sprawling composition in concrete, water, stone, metal and wood (bottom right). 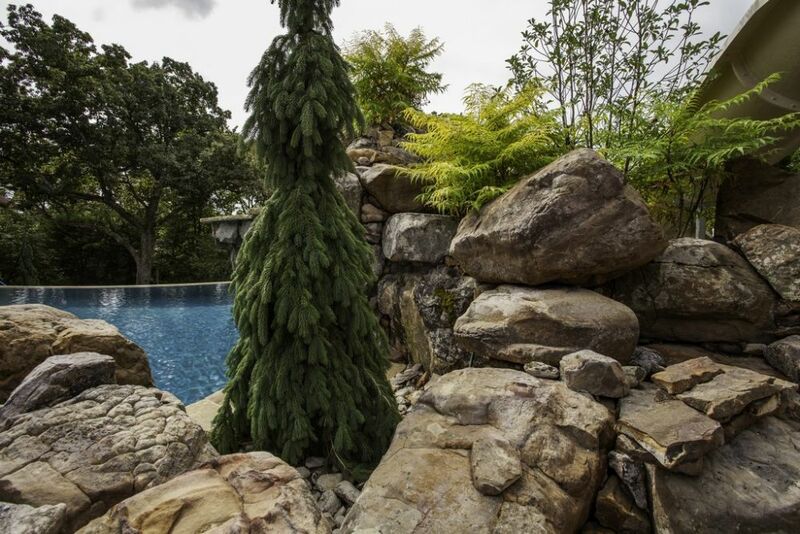 Hiding the equipment was a key decision: Neither we nor the clients wanted to see the usual sort of equipment pad on the upper level; they also wanted certain pool-house-type amenities, including a bathroom and a shower. Given the lay of the land, placing this multi-purpose room below the cabaña just made sense. 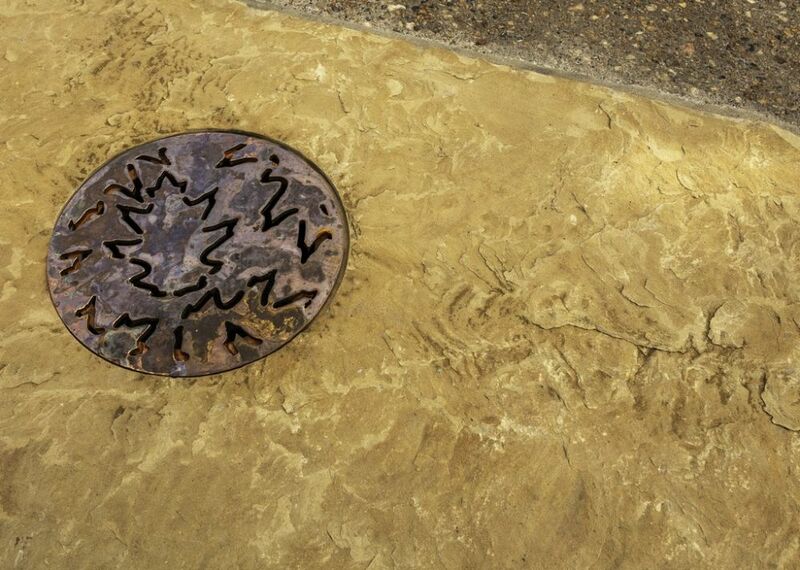 It also makes for easy, year-round access for routine service and maintenance. Hiding the slide was another big design factor, with (as mentioned above) the grotto structure offering the ideal solution. The clients wanted the grotto to be grand – able to hold a large number of people and offering lots of in-pool protection from the hot sun. This freed us up to go really big, including a bridge to reach the top of the structure and filling in the gaps with enough trees and plants that the slide will (eventually) vanish from view from most key angles. The roof of the grotto includes large, flat waterfall rocks, but there’s no direct access to this shelf, as it is not intended to be a jumping platform. Just to be sure, however, the water below the ledge is deep enough for safety. The water in the lower basin is deep, too, to accommodate bodies flying off the long slide. While there’s plenty of possibility here for very active play, there are also three elements that inspire calmer interactions: The big spa, the tanning shelf and the small kiddie-depth pool at the base of the spa’s dam wall. The waterfall plays its role by spreading nice sounds throughout the upper level – easily masking any raucous play below. The cool thing is that the flow over vanishing edge serves to make the upper pool seem a bit smaller and more integrated into the space. The three water levels – spa, upper pool, lower pool – actually cover a very large footprint, but the multiple levels ease the impression of size and make the composition both more accessible and easier on the eye. 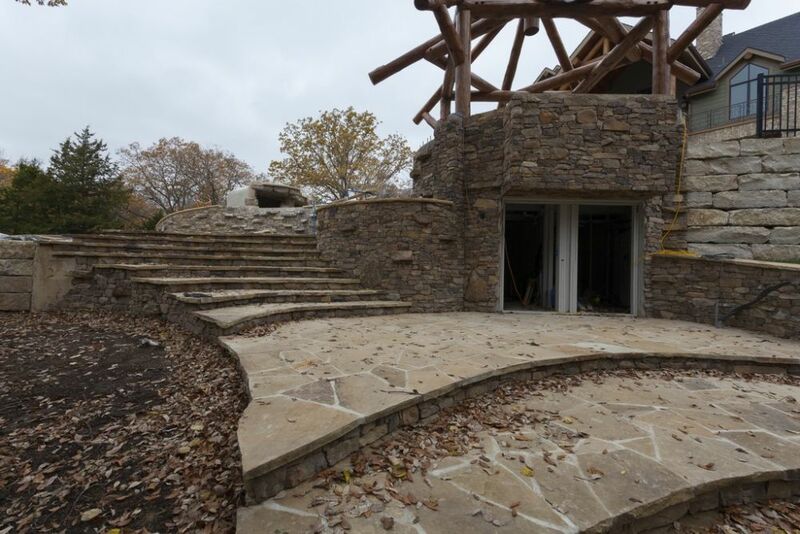 Beautiful materials help, too, with generous use of Oklahoma sandstone throughout the space by the stonemasons at Nature’s Touch (Kansas City, Mo.) – not to mention picking up the home’s big, exposed beams in the cabaña’s roof structure, a task executed by carpenter Damon Rau. As a company, we pride ourselves on being about more than the water. In fact, we pay a significant amount of attention to landscape and hardscape details, including the unusual, custom-fabricated firepit (with equipment from Fire by Design of Las Vegas, Nev.) and the incised deck grates and covers as well as the extensive, twisting details of the bridge – all courtesy of our steel fabricator, Kansas City Metalworks (Kansas City, Mo.). The plant selections are native to our area but have been carefully selected to further the impression of a high-country environment. They’ll fill in and, before long, will soften the overall look of the space, frame the grotto and effectively hide the slide from view – a disappearing act to which all of us are looking forward. The long and short of this project is about identifying needs and figuring out ways to make a poolscape harmonize with its surroundings, a home’s architecture and a family’s enthusiastic wishes. They may not wake up thinking they’re in the Rockies, but they’re now out in their backyard on a much steadier basis through seven months of the year – far more than ever before. We take it as a clear sign that, after 16 long months, the illusion we created is working its magic.